I’m not the world’s biggest fan of four wheel drives, but it’s nice to see one that’s obviously used for its intended purpose, rather than just cruising around the suburbs. It appears to be real mud, not those stick-on blobs you hear about. Sad that it’s the exception rather than the rule. We have one and enjoy it. So do tens of thousands of other urbanites. In fact we have had it for over a year and only once have actually engaged the 4WD. A lot of people are envious of us. @Higlly, maybe you’re new here. 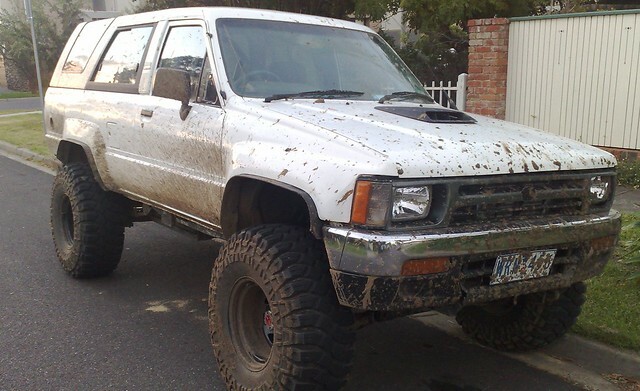 It’s sort of sad that a mud-splattered 4WD is so rare that it’s worth a photo. All the ones we see in our ‘hood are pristine and shiny and seem to only go as far as private school and the shops! Higlly. Not envious. I have a real four wheel drive that does real work. On a large property. Carting hay and bits of machinery and stuff around. Rarely if ever sees the tar. Please don’t bring your toy near our place. We have enough of you destructive urbanite wankers to contend with. Stay under your bridge, like a good troll should. Arrhh… older my sister who’s always been on my back about everything environmental has recently moved to Kyneton and now decided she needs to upgrade her little Citreon for a 4WD Defender! I’ll admit that the Citreon probably isn’t too appropriate as she now at least heads onto dirt roads fairly often and commutes between Melbourne and Kyneton nearly daily (which isn’t what the Citreon is designed for), but a dirt road does not require a bloody defender…. I’m trying to convince her that if she does buy a new car it should be something in between. No point going from one extreme to the other.